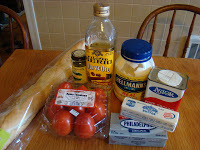 Step one: Slice french bread, spread melted butter on slices & broil until slightly brown. cool and then keep in an air-tight container until needed. 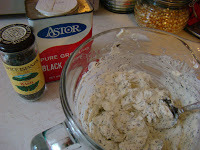 Step two: Mix one package cream cheese with ¼ cup mayonnaise and an over-sized teaspoon of pepper & an over-sized teaspoon of basil. 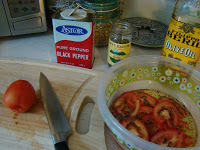 Step three: Slice the tomatoes thinly and place in a container with olive oil and lots of pepper & basil. All of these steps can be done a day or two ahead of time. 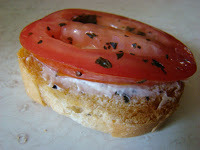 When you are ready to serve: spread cream cheese on bread and top with one tomato slice. 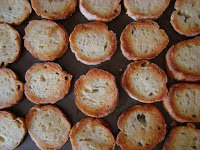 Slice french bread, spread melted butter on slices & broil until slightly brown. cool and then keep in an air-tight container until needed. All of these steps can be done a day or two ahead of time. 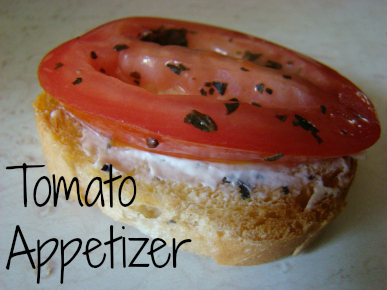 When you are ready to serve: spread cream cheese on bread and top with one tomato slice. Oh that looks SO good! Thanks for sharing!